Developed many years ago by the Italians as a way of moving more safely and quickly through steep, mountainous terrain. Usually a cable will be fixed to the rock and next to this rungs will be in place. Using lanyards to attach to the cable, we climb using the rungs and occasionally the rock too. Having 2 sections to a lanyard enables the user to remain attached at all times, even whilst moving from one section of cable to another. Shock absorbers built into the lanyard help reduce forces in the event of a fall. Note: it is very important not to substitute proper lanyards for climbers slings, these will not work effectively. If in any doubt seek professional advise. We can arrange guided trips on any of these Via Ferratas and have all the necessary equipment. 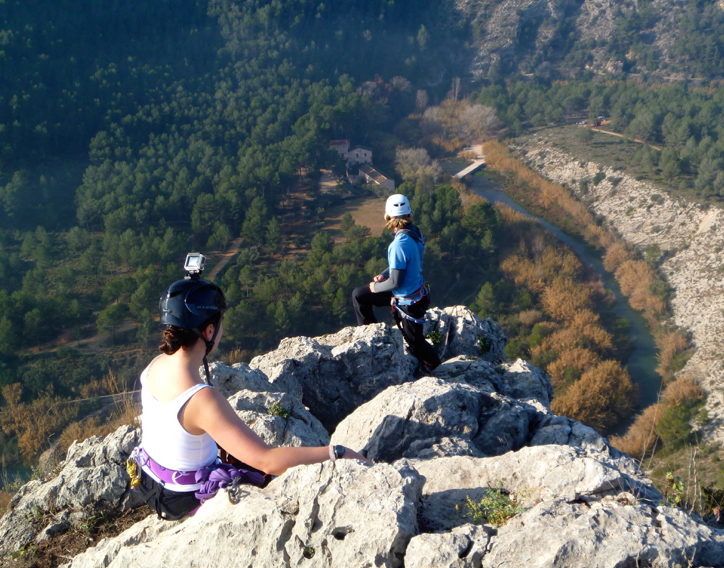 The finest Via Ferrata in the area, this makes for a fantastic day out on a huge cliff face. There's about 230m of vertical height gain, so don't forget to pack a head for heights! Approach: Take the CV-70 through La Nucia and turn left at the 3rd roundabout on the town by-pass. This leads into a new urbanisation. Follow the main road through this and turn left at the top (next to a shallow water channel) to reach a large car park by a big green building. There is a Via Ferrata information board here, this gives approach details if needed. Follow a path over the water channel and into the Pine woodland. Yellow, red, and sometimes green dots mark the way on a good but small path all the way to the crag and Via Ferrata. Via Ferrata: The route is obvious but probably a little daunting. The scale of this rock face is like nothing else in the area, it's immense. The rungs are mostly quite close together. There's a couple of traverse sections, these are a lot of fun. During the ascent there are a number of ledges, these are really useful as resting places should your arms be feeling the strain. When the angle eventually eases and the top is reached, take a breather before locating the descent route. Descent: Follow a small path uphill towards a large boulder, just before reaching it turn right aiming for a solitary tree. The path is good here but remember where you are and tread carefully. Soon the path heads downhill and becomes more scrambly, there are a few sections equipped with cable so keep the lanyards on. A signpost points towards the top abseil / rappel station, this is very well equipped. Abseil 1: 25m - leads to a large ledge, fits half a dozen people in comfort. Abseil 2: 35m - to the ground. This one has a mildly overhanging section near the bottom. This is done in 3 stages and it's possible to do them independently if desired. Approach: From the N-332 turn onto the CV-50 to Tavernes, go straight ahead at the roundabout then take the 1st right following a sign for the Tennis club (near Agri co-op), drive to the top of the town to Calle Doctor Gomez Ferrer and park by a small park area with pine trees. Follow the PR-40 as it contours above the town heading towards Dels Amoldores then the Red Rock canyon sign. Keep on this track above the orange groves and onto a zig-zag path uphill (Revoltes) and when the path nears the canyon look out for the abseil station and bolts. 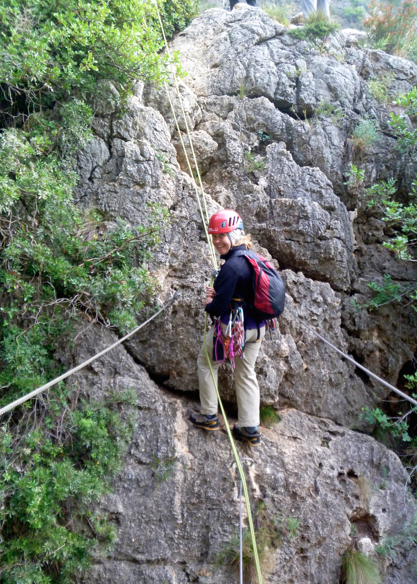 Via Ferrata: A very short abseil (only 3 or 4m) leads to a wire bridge, it's also possible to down climb this. Cross the bridge and follow the plastic covered iron rungs across and up the cliff until scrambling remains. The main section now lies ahead. Aim for the right hand side of the big crag to locate the start of this very steep Via Ferrata. The initial section requires either a long reach or a jump! Once on the rungs things remain very spaced apart and strenuous, but this all adds to the fun. There's a traverse part way up before the angle eases and the top is reached. Scramble / walk away from the cliff edge following a vague path, trend to the right to locate the final section which leads to a rocky crest. This is short but gives an easy route to the good descent path, so go with it. Once on the path turn right and follow it downhill, passing under a climbing crag after about 20 minutes. Continue heading towards Tavernes and back to the car. A short but very worthwhile Via Ferrata that can be combined with a day of climbing on the same crag. Approach: From Gandia follow the CV-60 for about 12km then turn onto the CV-610 towards Xativa. At Genoves turn left to Alboi. Immediately after crossing the railway line turn sharp left and follow this to a T-junction, turn left again and follow this narrow lane (surfaced) through a wooded valley to reach a parking area at a clearing. This is just above the river. Follow the track uphill towards the crag, aiming for the tallest section of rock. The Via Ferrata is just left of the lowest point of the crag and easily located. Via Ferrata: It's possible to see all of it from the base. Steep but pretty short at about 70 / 80m and well worth doing if you're in the area. The rungs are sometimes very spaced apart, it's necessary to use the rock quite a lot and this adds much to the interest and fun. Once at the top a fine rocky ridge continues for a short way and the cable ends. An easy scramble along the ridge leads to a small path leading down the right hand side and into the descent gully. This brings you back to the base in about 10 minutes. An excellent, easily accessible ferrata with loads of variety and an exposed ridge traverse. Approach: From Finestrat, follow the CV-758 towards Sella, then turn onto the CV-775 towards Relleu. Upon entering the village keep to the left and follow the by-pass, then re-join the CV-775 on the South side of the village. Take the 2nd right - signed Figuertes - and follow this surfaced lane to reach a small parking place next to a right hand junction. Continue on foot taking the right hand land again and look out for a small path heading uphill on the left, follow this (cairned) to the base of the crag near the right hand end. 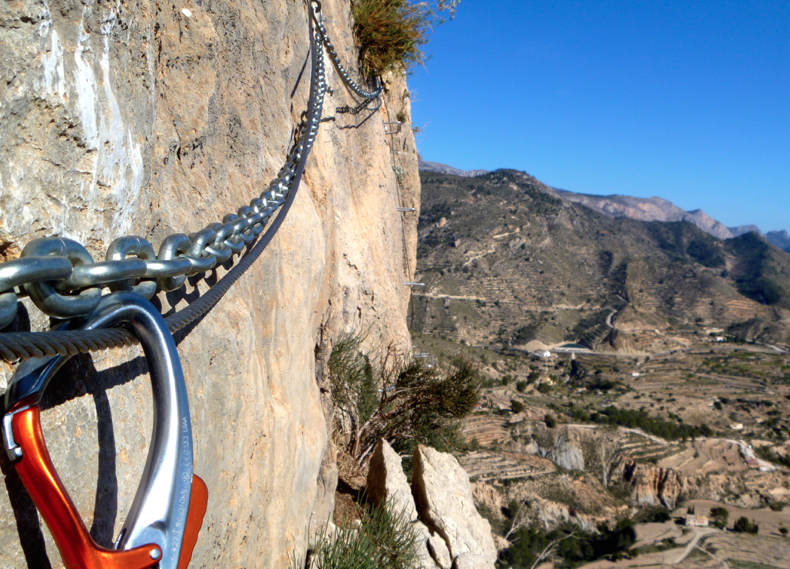 Via Ferrata: Very recently installed so all nice and shiny (2016), the cable begins well before the route leaves the ground, so if you're new to this activity it allows time to get accustomed to using the equipment. The rungs are spaced close together and it's never necessary to use the rock (but it adds extra fun if you do), the cable runs close by the whole time and is fixed to the wall at regular intervals to give increased safety. Chains have been fitted on the traverse sections, these act as handrails and work very well. Towards the top the gradient eases and soon the ridge is reached, this provides stunning views of the Puig Campana. The cable continues along the ridge for a while before trending right to reach a double bolt abseil station. There is another abseil station about 10 metres further on, either are fine to use and require a 60m rope. The abseil is over some very loose ground, so wear a helmet and keep it on at the base! Keep harness & lanyards at the ready, follow the small path downhill and soon the cable will be found again. This is now a path, but slippery so worth clipping into the cable. At the edge of the woods the cable ends, continue on the small path downhill through the woods to reach the road. Turn right here to reach the parking area. If you'd like a guide for these and many other via ferrata, canyons, ridges, climbs, and walks in the area, please get in touch anytime, we'd be very happy to help. This is a long and exciting Via Ferrata with sections requiring some rock climbing skills. It finishes on the summit of El Cid mountain. Approach: Take the A-31 motorway from Alicante towards Madrid, after about 15 minutes there is a turn to Petrer / Salinas, take this onto a minor road running alongside the motorway for a while. Keep heading uphill towards the large rock face ahead (this is the south face of El Cid) until a parking area at Casica del Forestal is reached at the end of the road. This is not well signed. From the car park follow a wide track going uphill in a North-Easterly direction, after about 25 minutes this track begins to descend at a sharp turning, look out for 2 cairns on the left and the cable above, this is the start of the via ferrata. Note, this is on the North face of the mountain. Via Ferrata: at about 300m of vertical ascent this is the longest of the ferratas in the area. All the difficult sections are protected with cables. There are also staples for some of the route, but not all of it, so at times it's necessary to apply rock climbing skills to make progress and this will add to the fun and challenge. The ascent is broken into sections and at about half height there is an escape route, should the weather turn bad. 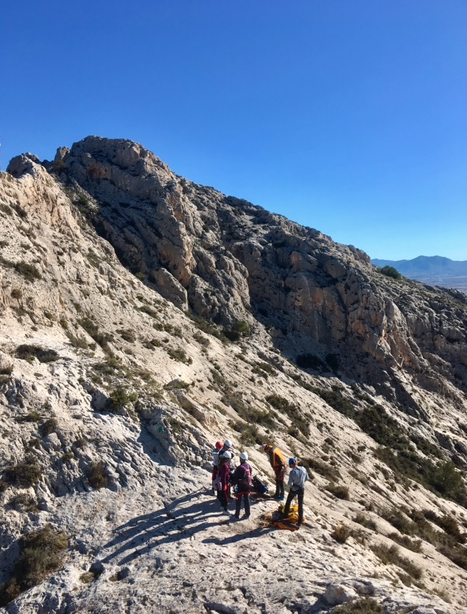 The ferrata terminates on the summit of El Cid at over 1100m and this provides a wonderful vantage point, take a rest here to soak up the view. Descent: Follow the well marked PR route heading down in the general direction of Petrer (the large town visible far below). Allow about 45 minutes to descend. Now extended so offering more of a journey and packs in plenty of interest along the way. Views across the plain are wonderful. Approach: Follow the A-31 towards Albacete & Madrid. Villena is a few miles beyond Elda / Petrer. Take the Villena junction from the motorway and follow signs for the Castle & Old town. Aim for the castle, soon pick up signs for Las Cruces park, follow these to the parking area. From here take the trail signposted for Via Ferrata Castillo Salvatierra. During the first few minutes of the approach the route isn't as clear as expected, but soon there are large green dots marking the way, follow these to a col and gear up there. Via Ferrata: From the col look for more green paint, this marks the first section of cable which descends gently over fine limestone slabs, this is more of a protected walk. Pass by the first ladder section, instead continue to descend along the slabs, soon another ladder section is reached, this is where it all gets much steeper! The route is diverse, with any steep sections being short-lived. There are two Tibetan bridges to cross, both are good fun. A short steep section after the second bridge leads to the summit and the end of the Via Ferrata. 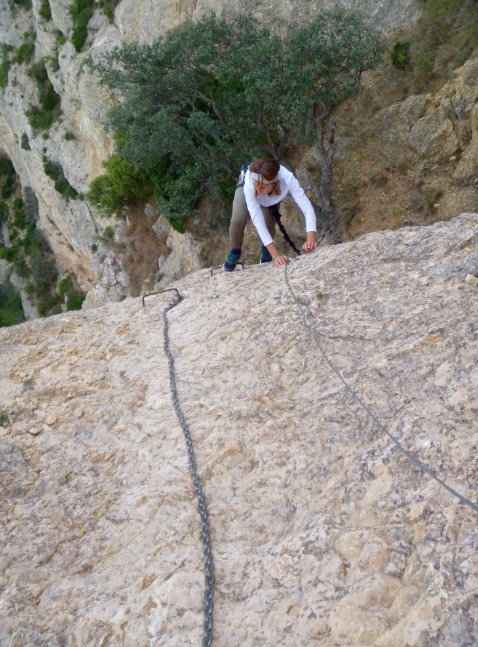 The route is well equipped and would be a good introduction to Via Ferrata. This route is also suitable for youngsters (just remember they may require specialist and child friendly via ferrata equipment). More green blobs appear to guide you back to the starting col, a good place to de-kit and admire the route and surroundings. 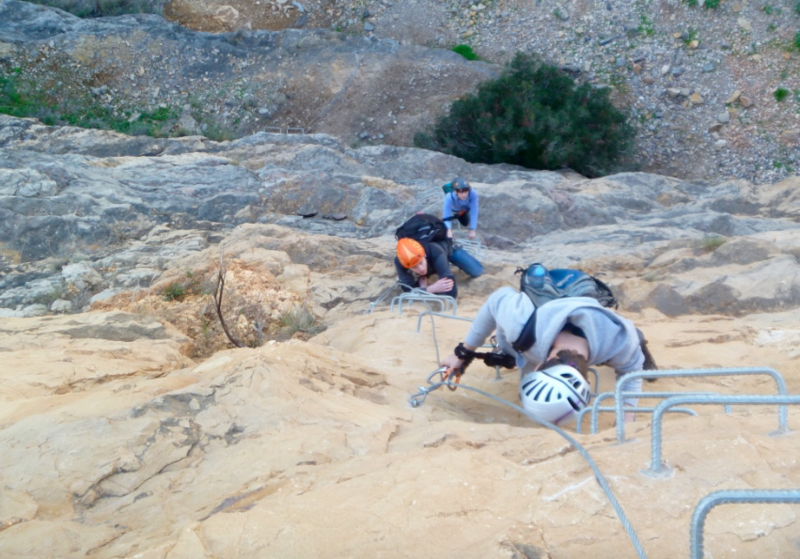 This is a newly installed and very short Via Ferrata situated in an old quarry on the Sierra Helada. Approach: Follow the N-332 to Albir, go through the town following signs for the Sierra Helada Parque Natural. There is a large free car park on the edge of the park (visitor information, loos, vending machines too). From the car park take the main track, passing the visitor centre and almost immediately turn right here onto a smaller track leading through pine woodland. This leads gently uphill to the quarry in about 10 minutes. There are picnic benches near the base of the Via Ferrata, this makes for a good place to put on harness, helmet, etc. It's also a very pleasant spot for lunch, with panoramic view to the Puig Campana and Ponoch. Via Ferrata: At only about 40m height gain, this is super short, but it certainly makes for a good introduction to the sport. It is very well equipped and is very steep throughout. Descent: 2 options, with a signboard there to remind us. Either follow a marked trail down to the left. Or go to the right, descending gently until a chain and cable are reached, clip into the cable and follow it to an abseil station. 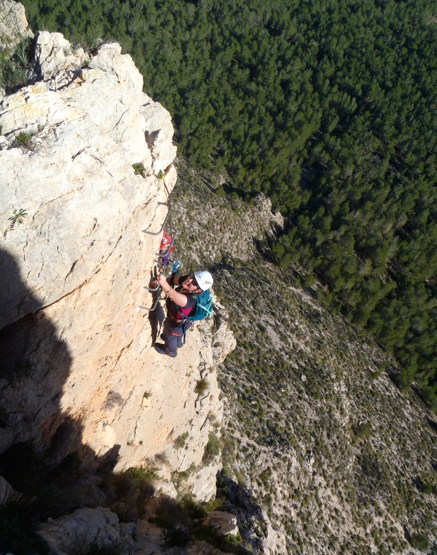 An abseil of about 20m leads to the base of the Via Ferrata.